With all eyes on the fight over border security funding, Republicans and Democrats are quietly negotiating over the other aspects of the government spending package. 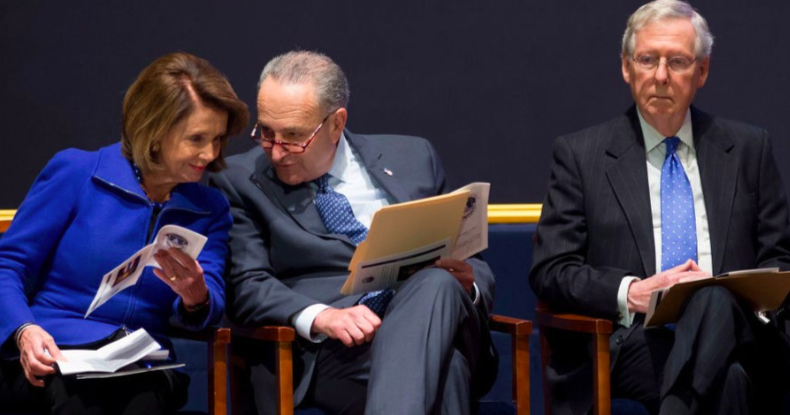 Pelosi and McConnell are striking a deal to fully fund the State Department's aid fund, which would not only restore the funding that Trump cut from the United Nations, but it would actually INCREASE the funding to their most radical programs! They want to rush this through before you notice what is going on. DO NOT let the globalists get away with this! Send your instant and urgent FaxBlast right now and DEMAND that Congress kill Pelosi's UN funding plan and pass the American Sovereignty Restoration Act instead to pull the plug on the United Nations for good! With all eyes on the fight over border security, many of your colleagues are quietly negotiating over other provisions in the omnibus spending bill that will eventually re-open the government. Republicans and Democrats have already agreed on the State Department's appropriation bill... and it is the most un-American spending package I have ever seen. Not only would this plan expand foreign aid to foreign countries that hate America, but it would also restore and increase funding to the United Nations and its most radical programs! President Trump has spent the past two years cutting funding to UN programs that go against our interests. That includes the UN's gun control treaty, the radical climate treaty, the anti-American Human Rights Council, the UN's Palestinian Refugee Organization, and the pro-abortion UN Population Fund. Every single time that we have given the United Nations funding, they have used it to try to chip away at our sovereignty. Enough is enough. I am demanding that you put America first! You need to kill this radical plan to restore and increase the United Nations' funding. Instead, you MUST force a vote and pass the American Sovereignty Restoration Act. Not only would this pull the plug on the United Nations, but it would block UN officials from ever gaining control over elements of the US Armed Forces. It would also eliminate diplomatic immunity for United Nations officials. This is how you put America first. If you allow Pelosi to restore and increase the United Nations' funding, I swear that I will not rest until you are removed from office!